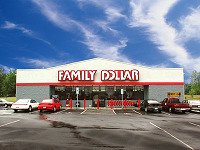 Family Dollar Stores, Inc. is one of the fastest growing discount store chains in the United States. During the last ten years, more than 4,000 new stores have been added to the chain, of which over 2,500 were added in the last five years. The merchandising concept that drives this growth offers customers good values in low cost, basic merchandise for family and home needs. Our merchandise is sold at everyday low prices in a no frills, convenient, self-service environment. Most merchandise is priced under $10.00. Stores are located in a contiguous 44-state area ranging northeast to Maine, southeast to Florida, as far northwest as Idaho and southwest to Arizona. Family Dollar stores generally range in size from 7,500 to 9,500 square feet, and most are operated in leased facilities. The relatively small size permits the Company to open new stores in rural areas and small towns, as well as in large urban neighborhoods. Within these markets, the stores are located in shopping centers or as freestanding buildings or in urban storefronts convenient to the Company's value-conscious customer base. During the fiscal year ended August 27, 2005, the Company opened 500 new stores and closed 68 stores to bring the number of stores in operation at fiscal year-end to 5,898. Family Dollar presently plans to open 400 new stores during the current fiscal year ending August 26, 2006. Family Dollar's headquarters are located in Matthews, North Carolina, just outside of Charlotte. The Company operates automated full-service distribution centers in Matthews; West Memphis, Arkansas; Front Royal, Virginia; Duncan, Oklahoma; Morehead, Kentucky; Maquoketa, Iowa; Odessa, Texas; Marianna, Florida. The Company has been a publicly held corporation since 1970 and its Common Stock is listed on the New York Stock Exchange under the ticker symbol FDO. A compelling place to shop. . .
A compelling place to work. . .
A compelling place to invest. . .